This weekend ended up being a dramatic one, I collapsed in a restaurant on Friday night during a meal out with Nathan and our friends. A combination of a big meal, exhaustion and feeling too hot I think. Luckily, everything is fine but it meant that Saturday needed to be a slow, quiet day for me. Which was the perfect time for us to put our toucanBox to use. toucanBox is a flexible subscription box for 3-8 year olds, delivering craft boxes to your doorstep. Ava loves crafting so I knew that this box would go down well. We were sent the fortnightly box which is the perfect letterbox size so it just pops onto your doormat, addressed to your child, which adds to the excitement. The "petite" box, as it's called, contains one activity for your child which has been specially created by an educational specialist. The box costs £3.95 + 98p postage. The "Grande" box is a monthly box which contains two activities and costs £9.95 + £2.95 postage. Or if you wanted to go all out, you could subscribe to the "Super" monthly box which costs £16.95 + £2.95 postage and contains 4 activities. 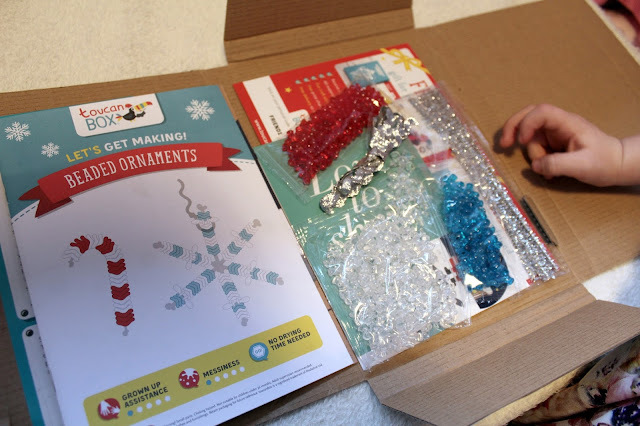 With us being so close to Christmas, Ava's box contained a festive theme and we were asked to make some beaded ornaments for our Christmas tree. This was right up Ava's street as she loves anything girly and fiddly. The box contained, 4 packs of beads (red, clear, blue & snowflake shapes), some pipe cleaners and some ribbon. We also received an activity book, a sticker and some leaflets for mummy to sift through. The educational focus of this box was physical and fine motor skill development. Ava very much enjoyed these activities, although I was on hand to help knot the pipe cleaner, which was quite difficult, and sharp, for little fingers. Ava barely needed my help to complete the tasks and it was a lovely, calm activity for her to do, which was exactly what was needed. She enjoyed completing the activity book afterwards which was brimming with colouring and puzzles. I'm not sure that the box would satisfy Ava for 2 weeks until her following box arrives, as she is the type of child who wants to get it all done right away. You could however do the activity in the first week and the activity book the following week as this even contained a recipe which looks fun to make. All in all I thought that the toucanBox was a fantastic idea and great value for money, not only are the activities fun, they are educational and help to develop your child's skills. As the days are getting colder, these are the perfect idea for those who like to hibernate a little during the Winter months. For those of you who may want to try a toucanBox for free follow this link and use the code BLOGGERSTREAT to receive your free taster box. Order your box by the 15th December and you'll receive limited edition Christmas crafts. 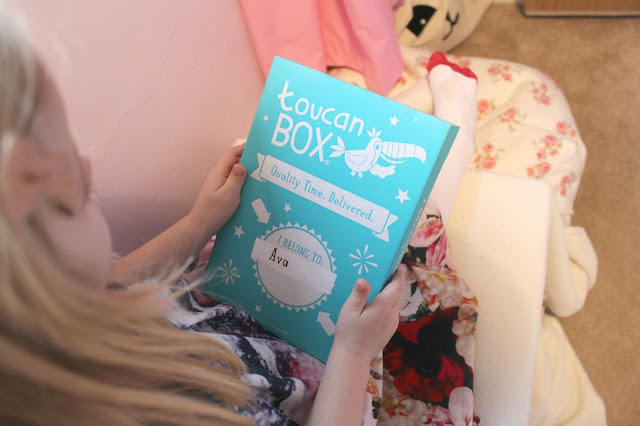 I know one little girl who will be eagerly awaiting the arrival of her next toucanBox! For more information visit the toucanbox website. *We were sent the toucanBox free of charge for the purpose of review. All opinions are my own.